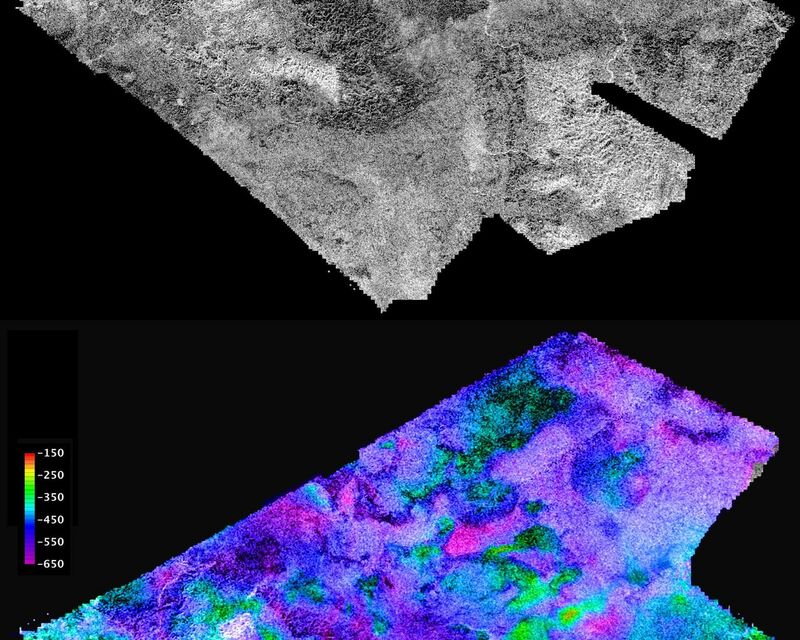 Cassini's radar mapper has obtained stereo views of close to 2 percent of Titan's surface during 19 flybys over the last five years. 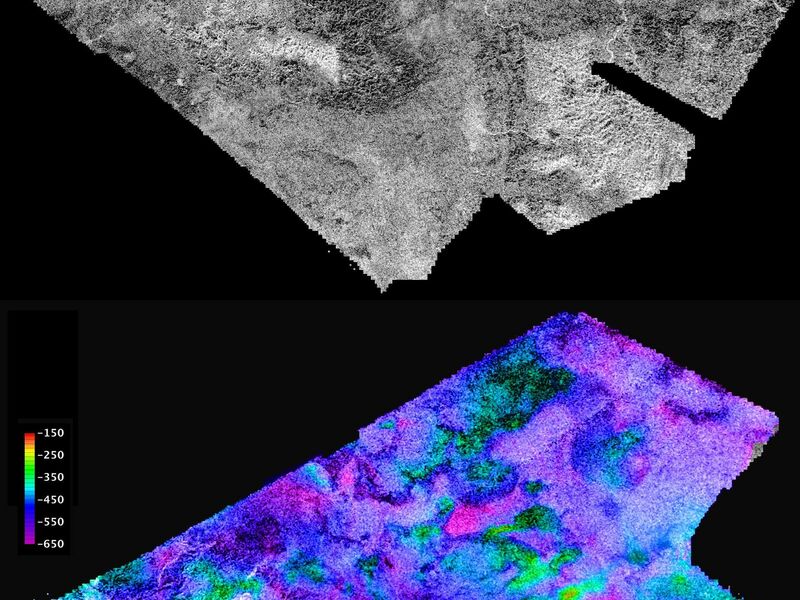 The process of making topographic maps from images is just getting started, but the results already reveal some of the diversity of Titan's geologic features. 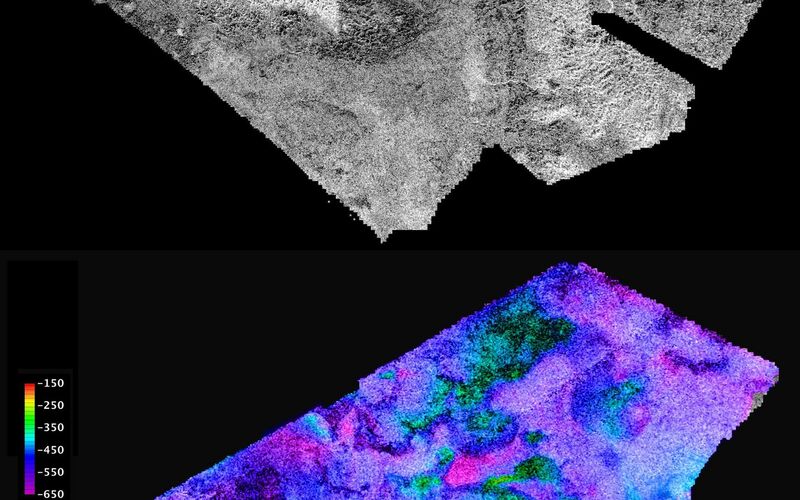 This pair of images covers part of Hotei Arcus, an infrared-bright and possibly time-variable feature that has been hypothesized to be cryovolcanic, based on the presence of flow-like features in the radar images. The radar data shows that these flows, most of which have radar-dark margins and bright tops, are 100 to 200 meters (300 to 600 feet) thick. In combination with the low slopes down which the material flowed, these thicknesses suggest the material was at least as viscous (stiff) as basaltic lava on Earth. More quantitative analyses of the behavior of these flows should help scientists determine what their composition may have been. Narrow, bright channels nearby are cut into the mountains to the south and display little elevation change, consistent with a much less viscous fluid, such as liquid methane, which is likely delivered to the surface in the form of rain. The region shown here is centered near 30 degrees south latitude, 83 degrees west longitude, and is about 860 kilometers (530 miles) across. The maps are in equirectangular projection with north at the top. The images used for mapping were acquired during flybys on Feb. 22, 2008, and May 12, 2008 (known as T41 and T43). The T41 image is shown in black and white at the top. It has a pixel spacing of 351 meters (about 1,200 feet). 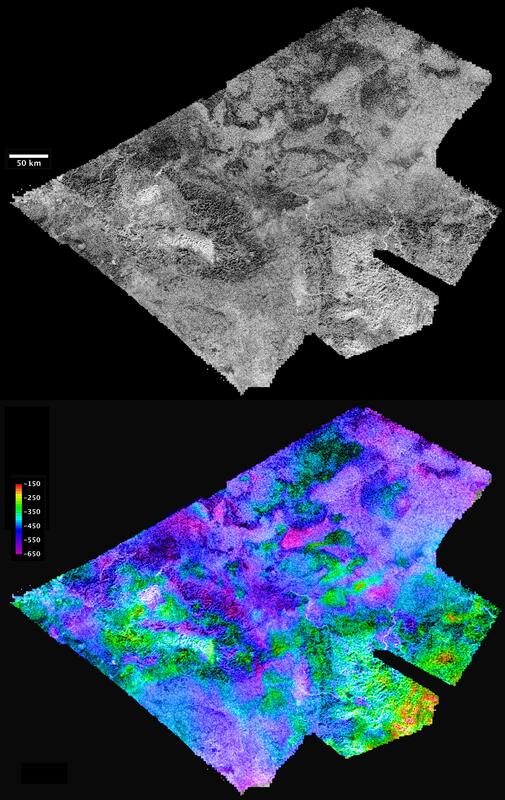 Below, the same image is shown with color coding to indicate elevations, as shown by the color bar at left. The total range of relief from purple (low) to red (high) is 500 meters (about 1,600 feet). Zero elevation corresponds to a distance of 2,575 kilometers (1,600 miles) from the center of Titan, which is approximately the average radius of the satellite. 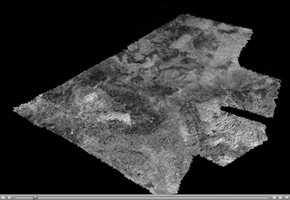 A video clip, showing a computer-generated flyover of the area based on the topographic and image data in black and white, is shown in Figure 1. The vertical exaggeration of this movie is 20 times. The movie starts with an overhead view, with north at the top. These views show rugged mountainous areas in the lower left and lower right, and blobby (lobate) flows in the top (northern) part of the region. The point of view then flies down to look across the terrain from the west, with the mountains in the "forked" end of the map in the foreground. Then it rotates around to the north side and finally zooms in partway toward the center of the map. Rugged areas are generally high, and the narrow bright channels flow out of valleys in these mountains. In the flows area, some of the bright areas are the tops of flows and some are the lower surface that the flows sit on. In between, the edges of the flows stand out because they appear somewhat darker than either the flow tops or the underlying surface. This radar-dark appearance probably means that the flow edges are relatively smooth. For more information about the Cassini-Huygens mission, visit http://saturn.jpl.nasa.gov/index.cfm.